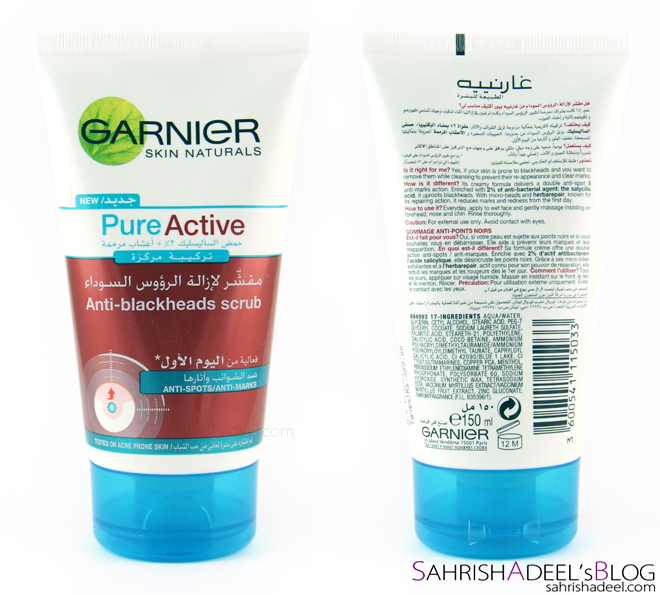 Garnier Anti-Blackheads Scrub - Review | Sahrish Adeel - Malaysia based Pakistani Beauty & Lifestyle Blogger! Garnier is one of my highly tested and trusted brand when it comes to face washes and body lotions. Today I have their Anti-Blackhead Scrub on my blog and let's see if this one worked for me or not. 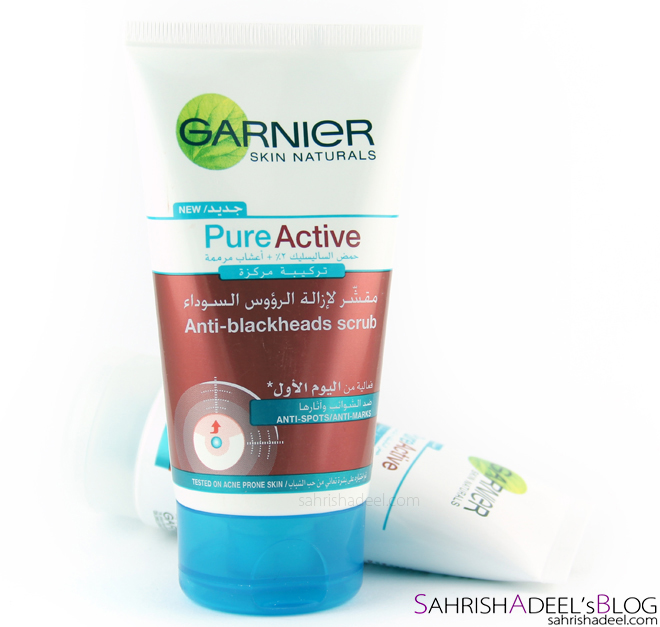 Anti-Blackheads Scrub is from Garnier's range called Pure Active. The whole range is designed to clear impurities instantly and to keep them away from skin. This scrub / face wash comes in a tube and contains 150 ml of product. I have used quite a few face washes by Garnier and I am glad that a few worked for me in the past. There is no doubt that Garnier is one of the most affordable skin care brand with good quality products. I not only review their products just on my blog but me and my family is a regular consumer of their face washes, creams and not to forget; one of my favorite addition in my moisturizer collection, Whitening Moisturizer - Milk Lotion. Anti-Blackheads Scrub has a thick texture with some granules that work as exfoliat-ers. It is not just scrub but a face wash too which I would suggest to use for once a week because this thing is heavy for everyday use. But if you have bad blackheads, you can use it on specific areas twice a week. It has a minty smell and feels cold onto the skin. Never like minty shampoos and can never get used to to minty scrubs / face washes too. I can only tolerate a minty mask on my skin and that too not too often. Does it work? Yes it does but results can be seen after about four weeks, roughly about 8 times of use. You should use it after cleansing your skin (skip that step if you are lazy or in hurry), scrub your face with the product and rinse off. Use a toner and finish it off with your day / night cream or a moisturizer. Oh and it does not scratch off your skin specially cheek area. Overall, I liked this scrub but the fact that it gives a cooling sensation to my skin, I don't really reach out for it too often. 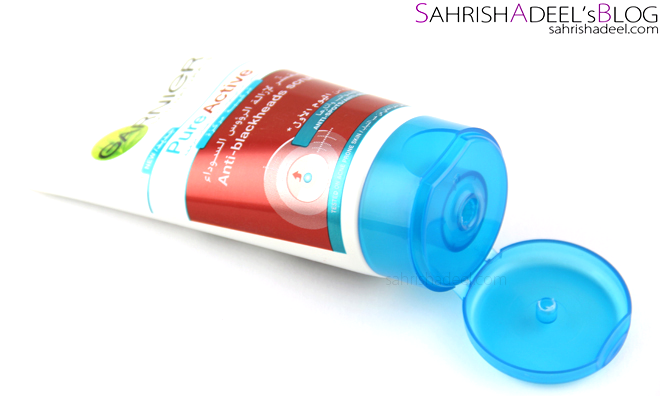 Each tube costs PKR 399 and is available all across Pakistan. This product is also available in other countries, so do check your nearest drugstore for the availability. Check out Garnier's Pakistan Facebook page for more updates on their range.